Alcatraz Island has a long and rich history that goes much further back than the famous prison that housed Al Capone. The Island housed the first Lighthouse on the west coast. The prison originally was a built as military fortress and ended up housing civil war prisoners. After becoming no longer useful to the U.S. Army, the government set up a federal prison that housed many famous and notorious inmates. After the prison was closed, the island became barren and a Native American Indian occupation held “the rock” from 1969-1971 to protest their civil rights. Around 10,000 years ago, the Miwok Indians, who lived in and around present day Marin County and the Ohlone Indians, who lived around San Francisco Bay, were the first people that visited Alcatraz Island. Although it is not sure what the early use of the Island was it is thought that the island was used as a camping and fishing point for the Indians. Fork lore says that the island was used to banish those who did not follow tribal laws. Around 10,000 indigenous Indians lived around San Francisco bay when Spanish Explores arrived. August 5, 1775 – Spanish LT. Juan Manuel de Ayala sailed to San Francisco Bay and studying the harbor. He discovered the rocky, barren island and named it “La Isla de los Alcatraces” meaning Island of the Sea Birds. February 2, 1848 – California becomes possession of United States after the Mexican War. Gold was discovered in the hills of the Sierra Mountains and a gold rush began with heavy migration to California. San Francisco populations in three years went from app. 500 to 35,000 with gold seekers. 1850- Gold rush was in full force and California was admitted in Union. 1859 – The U.S. Army realized that the San Francisco Bay posed a threat by enemies and built a military fortress on Alcatraz Island that would become the biggest fort west of the Mississippi River. June 1, 1854 - During the gold rush tons of boats were entering the San Francisco Bay rocky coastline. The first lighthouse on the west coast was built on Alcatraz Island. 1860 – As the military fortress become less needed as protection is became more important at housing soldier prisoners. 1907 – Guns removed from fort and became officially a Military Prison. 1934 - Military turns over prison to BOP – Bureau of Prisons. BOP Converts prison into state of the art, high security federal prison. Soon Alcatraz Prison will become most famous prison in the United States. 1934-1963 – Alcatraz housed many notorious and famous prisoners, such as Al Capone, Machine Gun Kelly, and “Birdman” Robert Shroud. 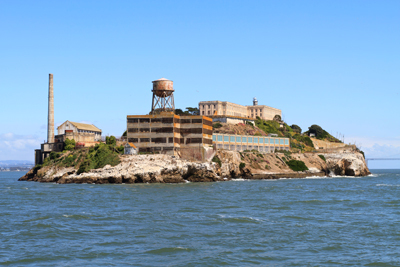 Many prisoners tried their chances at escaping “the rock” located in rocky and cold San Francisco Bay. Alcatraz was a prison that only housed inmates that were transferred. No judge could sentence anyone to Alcatraz. Only the most difficult prisoners would get sent to Alcatraz. It is what a “super max” prison is today. The average stay of prisoners was 5 years. There were 14 escape attempts by 36 different prisoners. Twenty-three were caught, six were shot and killed, two drowned, and five were never heard from again but thought to have drowned. 1963 – Attorney General, Robert Kennedy ordered Alcatraz closed due to high cost of maintaining prison. March 21, 1963 – Last inmates leave Alcatraz. Robert Stroud is one of the most famous prisoners at Alcatraz. He was known as “Birdman of Alcatraz”. He did not have any birds at Alcatraz and was not as gentle as portrayed in the movie. He was convicted in 1909 of manslaughter. While serving his sentence at McNeil Island, Washington, he attacked another inmate and was transferred to Leavenworth, Kansas. He murdered a guard in 1916 at Leavenworth and was convicted of murder and given the death sentence. In 1920, President Woodrow Wilson commuted his death sentence to life due to his mother pleas. His violent behavior often landed him in segregation. While he was serving 30 years at Leavenworth, he developed an interest in birds. He began studying the birds and wrote books on the subject. But due to finding contraband and “home-brews” hiding in his supplies he was transferred to Alcatraz in 1942. He spent 17 years at Alcatraz, 6 years in isolation, and 11 years in the prison hospital. In 1959, he was transferred to the Medical Center Prison in Springfield Missouri and died November 21, 1963. Alcatraz housed mostly unknown criminals who would not conform to rules and were considered violent and dangerous. Alcatraz was the prison that you got sent if you refused to follow rules. Alcatraz would make you follow those rules. Prisoners had four rights at Alcatraz, food, clothing, shelter, and medical care. Everything else prisoners had to earn. The prisoner’s could earn privileges by working at the prison. Privileges included visits from family, and/or access to library, music, and art. Once a prison exhibited behavior that was acceptable, he would be transferred out of Alcatraz. 14 attempts, 23 caught, six killed, two drowned, five disappeared. April 27, 1936 – Joe Bowers was working his job burning trash, and tried to climb over fence at islands edge. He refused to climb down and was shot and fell 50-100 ft to shore and died from his injuries. December 16, 1937 – In the Model Industries Building working at the mat shop, Theodore Coe and Ralph Roe filed their way through flat iron bars on windows. They made their way down to shore and disappeared in Bay. Their escape attempt occurred during harsh stormy weather and they are thought to have drowned. May 23, 1938 – James Maverick, Jimmy Lucas, and Rufus Franklin were working in the woodworking shop when they attacked an unarmed guard, Cline with a hammer. Cline died from his injuries sustained in the attack. The men climbed to the roof to disarm the officer on the tower but the officer, Harold Stites, shot Limerick and Franklin. Limerick died and Lucas and Franklin received life sentences.